Hurricane Irene slams into North Carolina in 2011. RHINE RIVER, NETHERLANDS - APRIL 28, 2015: Motor ship passes the gateway of Princess Irene. Netherlands. A weather map tracks Hurricane Irene as it crosses the Caribbean in 2014. 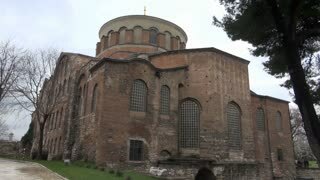 Video in 4K of The Haghia Eirene or Hagia Irene (Aya İrini Kilisesi) is a former Orthodox church and the first church built in Constantinople. Video of Hagia Irene or Hagia Eirene sometimes known also as Saint Irene, is an Greek Eastern Orthodox church located in the outer courtyard of Topkapı Palace in Istanbul, Turkey. RHINE RIVER, NETHERLANDS - APRIL 28, 2015: Motor ship stay in the gateway of Princess Irene. The Duke of Spoleto marries Princess Irene of Greece in 1939 in Florence. Flooded streets timelapse, Hurricane Irene. Timelapse after Hurricane Irene made landfall in 2011. Tourists enjoying the view from Miradouro de Santa Iria (Viewpoint of Saint Irene). Sao Miguel island, Azores. Looking east at the northern coast, from Miradouro de Santa Iria (Viewpoint of Saint Irene), Sao Miguel island, Azores.